Lincoln’s Code: The Laws of War in American History by John Fabian Witt, hits bookstore shelves in a few days. Eric Posner considers the legal and moral implications (and ambiguities) of Lincoln’s conduct of the Civil War in a piece at Slate.com. If there is any uncertainty surrounding this week’s Republican National Convention, it involves the threat of severe weather rather than the outcome. Mitt Romney’s nomination is essentially a foregone conclusion. Party conventions used to be more suspenseful, as was the case in 1860 when the Republicans put forth their second candidate for the presidency. Presidential nominating conventions of this sort, while not exactly novel, were nonetheless a fairly recent phenomenon at that time. Before the 1830’s, congressional party caucuses picked presidential candidates. The nominating convention was an innovation (and possibly the only lasting historical contribution) of the Anti-Masonic Party, which met to select William Wirt for the election of 1832, and other parties took up the practice not long afterward. Nineteenth-century conventions were consequential affairs, contingent on wheeling and dealing among delegates rather than ordained by the results of primaries. These meetings were thus not the coronation ceremonies they would eventually become, but crucibles of destiny that could make or break a man’s political career. 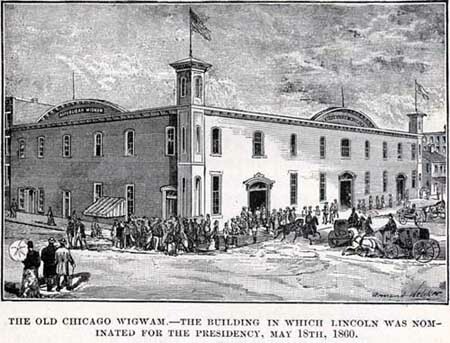 The Republican National Convention of 1860, which took place in a Chicago structure called the Wigwam (a two-story, wooden meeting hall with a capacity of about 10,000 people) was particularly momentous, because it selected the party’s first successful candidate for the White House and the man who presided over the worst crisis in the nation’s history. How did a man like Abraham Lincoln, who had enjoyed success as a legislator in his home state but whose national record was rather undistinguished, become his party’s pick for the highest office in America? That left Lincoln, who had three things working in his favor. He seemed moderate enough to appeal to a large number of voters. He had a body of speeches, debates, and published remarks which proved that he had a mind to reckon with. And he had allies at the Wigwam who knew how to work the delegates. 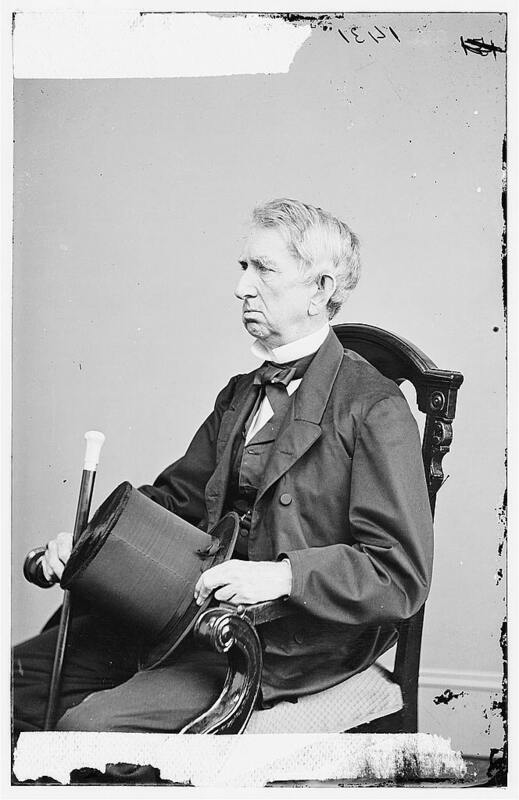 Lincoln came in second to Seward on the convention’s first ballot; on the third, he captured the nomination, thanks to able maneuvering by his friend David Davis and support from a group of Ohio delegates at a crucial point. This combination of handicapped Republican competitors, adroit supporters, and a moderate record, along with a sectionally fractured Democratic opposition, sent Lincoln to Washington, D.C. The election of this ostensibly moderate westerner drove the Deep South out of the Union. Ironically, the exigencies of the ensuing war caused this man, nominated for office because his rivals were too radical, to undertake measures that were downright revolutionary. All of it was contingent on what happened in Chicago, in an age when presidential nominating conventions offered up more uncertainty and excitement than they do now. Acclaimed actor David Strathairn plays Secretary of State William Seward in Steven Spielberg’s upcoming film Lincoln. He recently spoke to the newspaper in Seward’s hometown of Auburn, NY about the role and his preparation for it; you can read the first part of the interview by clicking here. The Abraham Lincoln Institute for Leadership and Public Policy is pleased to announce Dr. Jason R. Jividen as the R. Gerald McMurtry Memorial Lecture Series speaker. The Duncan School of Law will host the event on November 9, 2012 and will provide Continuing Education Units (CEU). Dr. Jividen’s lecture title is, “The Lincoln Image and the Idea of Equality in American Presidential Rhetoric.” Dr. Jividen will briefly survey and critically discuss presidential appeals to Lincoln, and Lincoln’s ideas about equality as a paramount political good. Jividen argues that, in these appeals, Lincoln’s understanding of equality is often misunderstood or misrepresented and that this has significant consequences not only for how we might understand Lincoln, but also for how we understand the legitimate ends and means of American republicanism. Dr. Jividen is Assistant Professor of Politics in the McKenna School at Saint Vincent College in Latrobe, Pennsylvania, and directs the Aurelius Scholars Program in Western Civilization. He also serves as Fellow in Civic and Constitutional Affairs for the Center for Political and Economic Thought. Dr. Jividen earned his Ph.D. in Political Science at Northern Illinois University in 2007. Prior to joining the faculty at St. Vincent College in the fall of 2010, Dr. Jividen served as director for the Political Science program at the University of Saint Francis in Fort Wayne, Indiana. His teaching and research interests include the history of political philosophy and American political thought and institutions. He has presented numerous conference papers and delivered public lectures on topics in ancient and modern political philosophy, the principles of the American Founding, Lincoln’s political thought, and American Progressivism. Dr. Jividen is author of Claiming Lincoln: Progressivism, Equality, and the Battle for Lincoln’s Legacy in Presidential Rhetoric (DeKalb: Northern Illinois University Press, 2011), which critically examines the attempt of progressive and modern liberal U.S. presidents to appropriate the Lincoln image into their political rhetoric. Dr. Jividen’s research interests include political philosophy and American political thought and institutions. LMU’s Duncan School of Law is located at 601 W. Summit Hill Drive in Knoxville, Tennessee. What’s your favorite Lincoln biography? By the time you factor in the books on more specific aspects of Lincoln’s life—his religious beliefs, his presidency, his marriage, and so on—you’re dealing with an almost overwhelming amount of material to read, more than that for any other American. If you’ve got a favorite biography of Lincoln, leave us a comment here at the blog and tell us what it is, and then head over to the WaPo site and add your suggestion. Spielberg’s film isn’t the only Lincoln project headed to the screen this fall. Saving Lincoln will tell the story of the 16th President’s relationship with Ward Hill Lamon, a fellow Illinois lawyer who became Lincoln’s self-appointed bodyguard. The filmmakers are using an interesting technique to combine live actors with original nineteenth-century photographic backgrounds. You can learn more about the movie by visiting the official website. As proceedings began Thursday, the judge announced in court that he’s received a letter from an inmate in Illinois who claims to have information about a link between the former police officer’s murder trial and the 16th president’s assassination. Aren’t you just the slightest bit curious?